As I get ready to leave, she says “Don’t forget to spend time with the Ancestors.” And remember she is always here to visit with, to sit and smoke and drink and share stories. 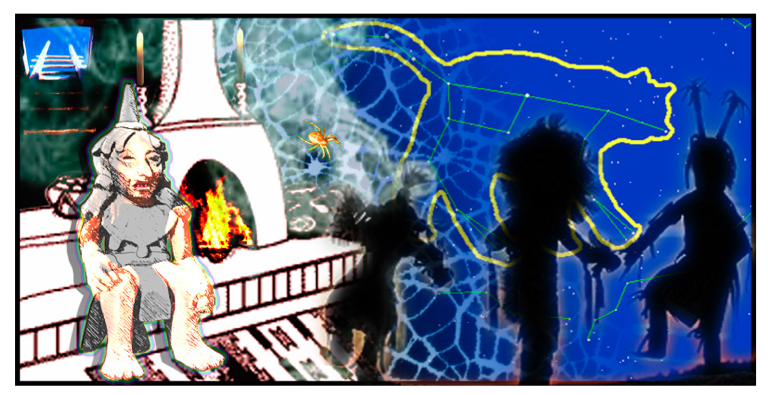 Other images shared by trance circle participants: ritual with Native American dancers; medicine woman with spider/scorpion webs – web of consciousness; bear cubs in a cave; ladder going through a hole in the wall/ceiling to the Big Dipper above. EBP journey notes and digital image by Mark Gilliland ©2008. Editors note: The intent behind our Artist in Trance program is to explore, document ritual posture experience using artistic mediums such as sketching, painting, sculpting, etc… Throught direct experience we combine the art field and the spirit world.